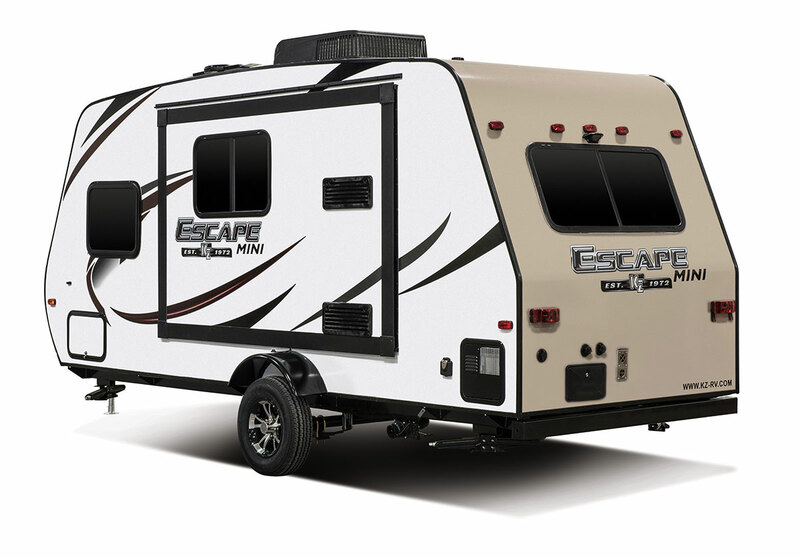 Shipshewana, Indiana based KZ RV in joining the arena of micro campers that sport the wheel wells outside the sidewalls that weigh around 2800 pounds and are around 20 feet long. You all know what style I mean. While the industry tends to call the style “teardrop” (well, it’s not a teardrop), it’s that design that looks like an R-pod, Winnie Drop, Hummingbird, and Comet. OK, now that you have that mental picture, it’s time to add to that list with the KZ Escape Mini. 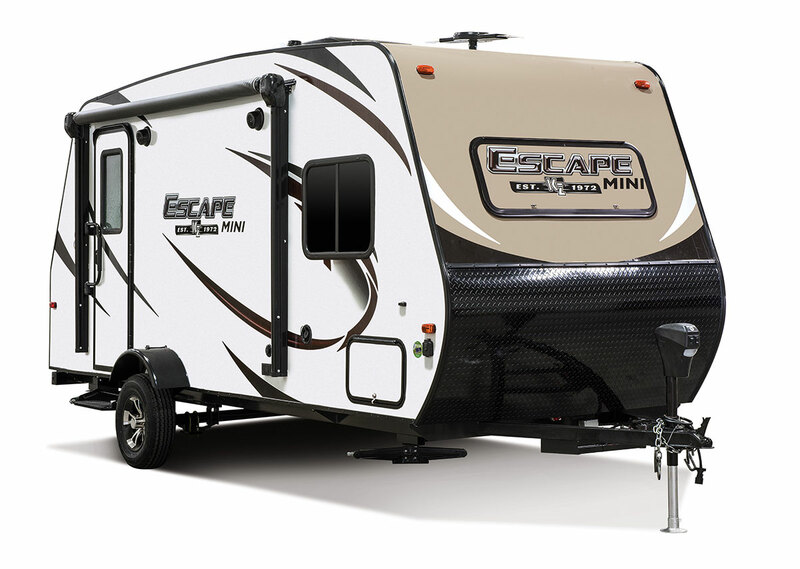 There’s a lot to be learned about the Escape Mini, but there’s quite a bit out there on the KZ website. However, as of this writing, they’ve yet to show up on dealer lots. What we do know is that it’s starting out with four floor plans, all listed at 20’11” total length. Two of them don’t have the weights listed, but these should be in the 2800-3000 lbs range. 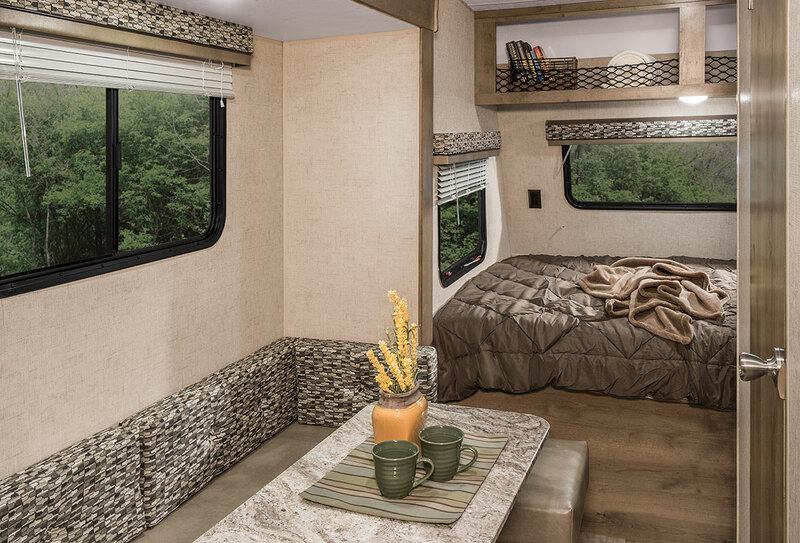 All come with a slide out, GRWR of 3750 lbs, and have a spacious 6’10” interior height. Now one thing I’d like to get clarification from on KZ is the width. Specs list the width at 8′. If true, that’s a good foot and a half wider than competitors, which are usually at 6 1/2′ wide. However, that 8′ listed “may” be from tire to tire and not wall to wall. If it’s tire to tire, then chances are the body width is probably the usual width of a model of this type. 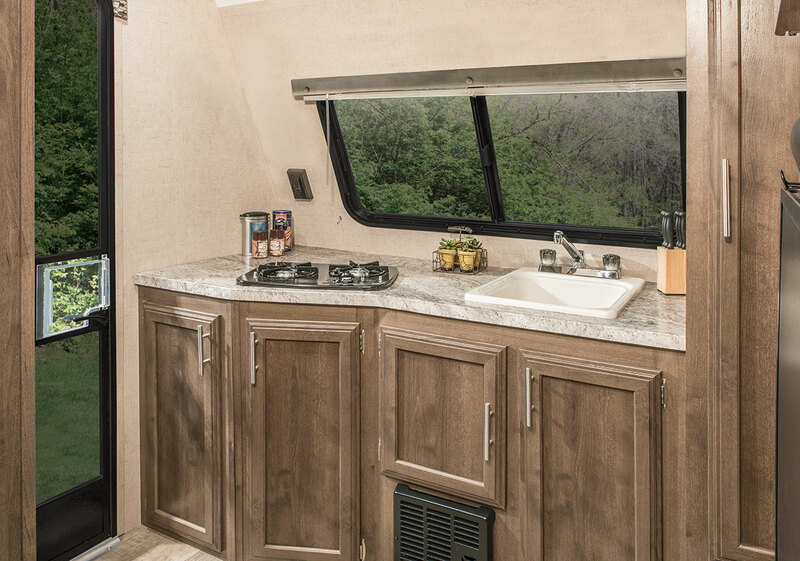 As for some of the interior features, the Escape Mini gives you a standard 2 burner stove, 4.2 cubic foot refrigerator, convection microwave, MaxxAir fan, 20K BTU furnace, and optional 13.5K BTU air conditioner, optional wireless backup system. The optional Off-Road Package includes 15″ mud tires, additional ground clearance, heated holding tanks, and double entry step. As for some construction aspects, it has your standard R-7 insulation, 5/8″ tongue and groove plywood decking, and a one piece seamless fiberglass roof with aluminum rafters. Also there’s full front pass through storage on all four models.